It’s a funny experience, publishing a book – something that one has lived and worked with for perhaps years and invested all sorts of energies into finally comes out, and there is an odd sense of anti-climax (it’s a lot like finishing a PhD). But it’s also odd to actually read one’s own book in proper book form, bound and beautiful, even though The Priority of Injustice is pretty much the only thing I have been reading since at least the summer of 2015. There is a kind of terror involved (what does it read like? ), but also a nice experience of affirmation, as you notice that there is maybe something coherent running through the whole thing (although maybe you have to have been reading, writing and editing it for more than two years to actually notice this). So, I have now read my own book, again, cover to cover, and annotated it in detail (but only in pencil…). At some point in the future, certainly next Spring, I will have to talk about the arguments in the book, so I am going to take the liberty of writing a few short posts over the next little while in which I am going to say out loud, to myself at least, what some of the main themes of the book are, as a kind of mnenonic practice. The first of the themes which are central to the overall arc of the book which I want to remind myself of is that of ‘arguing with theory’. 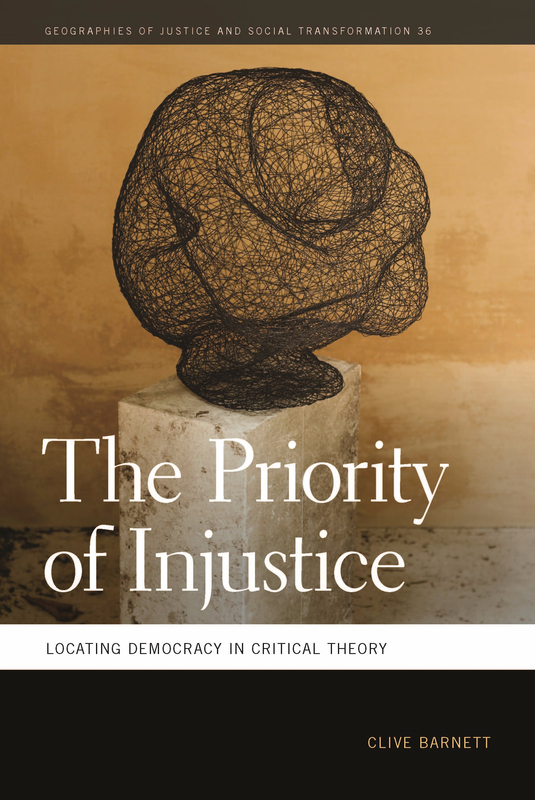 The Priority of Injustice is a book about theory, in the sense that, as I have previously mentioned, was once used by Talcott Parsons – it treats ideas as an archive of documents that “present problems of understanding and interpretation”. But I also try to move away from an idea of Theory as a kind of standing body of ideas that one is meant to display mastery over (some hope), and instead actually try out my hand at theorizing. I realise that that immediately sounds perhaps even more pompous than the idea of mastering other people’s ideas (if it is taken as developing a whole raft of new concepts all of one’s own), but it seems to me a more appropriate, and modest ambition. (There are a couple of things I have read since writing The Priority of Injustice that express very clearly the idea of theorizing I am working towards in the book, Richard Swedberg’s The Art of Social Theory and John Levi Martin’s Thinking Through Theory – I mention them here not least to underscore another aspect of the argument I am making in the book, which is that a social theory imagination involves a different, less theoreticist style of reasoning than the sorts shared by convergent traditions of political theory and cultural theory). There are two related senses in which I think of what I am doing in this book as theorizing. First, I outline an approach to reading for the “spatial grammar” of different traditions of political thought, which is meant to contrast to a taken-for-granted approach in critical spatial disciplines such as human geography or urban theory of correcting the bad ontological assumptions of traditions of thought found to be inadequately attuned to 40 years worth of thinking about relational spatiality (a habit that extends to a standard style of critique of the spatial ontologies of policy-makers or journalists or corporations or one’s fellow citizens). Reading for the spatial grammar of theories is directed by a principle of charity, to borrow an idea from Donald Davidson, that is, of trying to maximise understanding across what might appear to be incommensurable vocabularies. The notion of grammar, then, in this formulation is meant to direct analytical attention “to the actions being performed in the use of words and concepts”, so that when one comes across thinkers making use of spatial and temporal concepts then the primary concern should be to take seriously “what is really at stake in their expression”. This first sense of theorizing at work in the book is related to a broader argument, developed in the first two chapters, about thinking of the meaning of normative concepts like democracy not by reference to etymological derivation but with reference to their use in new situations. This ordinary way of thinking about concepts is linked to the second sense of theorizing in the book. It’s an approach that I seek to apply more fully in the three chapters of Part 3 of the book, in which I argue that the geographical turn in deliberative theories of democracy associated with discussions of topics like cosmopolitanism, global justice, or transnationalism is best interpreted as an occasion for a repeated disaggregation of the component parts of key principles, such as freedom, or equality, or participation. The point of developing this argument is to cash-out the suggestion I make at the start of the book, that we should think of ‘theory’ as something that “helps to direct our curiosity to issues that deserve further attention”. It leads me to recommend a heuristic notion of critical theory, borrowing this time from Andrew Abbott, where the aim of theorizing is to develop concepts “that help to orient new pathways to findings things out” – again, the contrast is meant to be with approaches to theorizing that develop models of what counts as proper politics or ideal democracy against which emergent forms always come up short. In Part 2 of the book, I elaborate this heuristic approach to the interpretation of concepts in order to to distinguish between different accounts of the distinction between ‘politics’ and ‘the political’. In what has become the standard interpretation of this distinction, the simple observation that action has conditions is transformed into strong claims about the apparent paradox that necessarily contingent foundations will always be prone to immanent forces of disruption. I suggest that the real value of the politics/the political distinction lies in the rather more prosaic task of helping “to open up new ways of investigating the conditions of political action”. It’s this version of the distinction that I then develop further in the reconstruction of the all-affected interests idea in Part 3 of the book, which I present not as a prescriptive rule for determining the scope of democratic inclusion or the form of rule, but as a guide to the analysis of the geographies of claims-making. It’s these two related ways of theorizing – I call them ordinary in places, heuristic in others, depending on the philosophical inflection in play at that moment – that I have in mind when I claim, towards the end of the book, that The Priority of Injustice is meant as “kind of prolegomena to democratic inquiry in a geographical sprit” – as I’ve said before, I think of this book as a kind of space-clearing exercise, as an attempt to clarify problems and issues which requite further investigation. Andrew Abbott, 2014, Digital Paper: A Manual for Research and Writing with Library and Internet Materials. Andrew Abbott, 2004, Methods of Discovery: Heuristics for the Social Sciences. W.W.Norton.